HALIFAX, Nova Scotia --- Through the National Shipbuilding Strategy, the Government of Canada is ensuring that the Royal Canadian Navy has the ships needed to carry out its important work, while creating significant economic benefits from coast to coast to coast. Today, the Hon. Carla Qualtrough, Minister of Public Services and Procurement and Accessibility, announced that the Government of Canada has officially selected Lockheed Martin Canada for the design of 15 new Canadian Surface Combatants that will be built at Irving Shipbuilding’s Halifax Shipyard. The winning bid is based on the BAE Systems Type 26 Global Combat Ship. The Government of Canada and Irving Shipbuilding will work alongside Lockheed Martin Canada to customize the ship design to meet Canada’s requirements and to incorporate Canadian systems and equipment. This design work is expected to take three to four years to complete. Construction is set to begin in the early 2020s. The initial contract with Irving Shipbuilding is valued at $185 million (including taxes) and will increase as design work progresses, resulting in significant benefits across the Canadian economy. The Industrial and Technological Benefits Policy will apply to this contract, ensuring that for every dollar the government puts into this contract, a dollar goes back into Canada’s economy. The National Shipbuilding Strategy is a long-term commitment to domestic shipbuilding that is about revitalizing and reinvigorating a world-class marine industry that equips the Royal Canadian Navy and the Canadian Coast Guard, supports Canadian technological innovation, creates well-paying stable employment and benefits the economic prosperity of Canada’s coasts and waterways. Contracts awarded to date through the National Shipbuilding Strategy will contribute an estimated $10.9 billion of gross domestic product and create or maintain more than 10,000 jobs during the period of 2012 to 2022. “Our government is providing the Royal Canadian Navy with the ships it needs to do its important work of protecting Canadians. This procurement process for Canada’s future fleet of Canadian Surface Combatants was conducted in an open, fair and transparent manner that yielded the best ship design, and design team, to meet our needs for many years to come,” said Carla Qualtrough, Minister of Public Services and Procurement and Accessibility. “We are providing our women and men in uniform with the equipment they need to do the important job we ask of them. Today marks an important day for our Royal Canadian Navy as we move closer to the construction of our 15 future warships. These highly advanced, state-of-the-art warships will enable our navy to monitor and defend our waters here at home, help us support our international allies and keep Canadians safe,” said Harjit S. Sajjan, Minister of National Defence. “The Canadian Surface Combatant project is one of the biggest procurements in Canada’s history. Our government’s policy ensures that Lockheed Martin Canada will invest in Canadian companies and workers, creating more jobs and supporting innovative research. When these ships are delivered, Canada will have a stronger naval fleet, with a strong and skilled shipbuilding industry to support it,” said Navdeep Bains, Minister of Innovation, Science and Economic Development. -- The Canadian Surface Combatant project is the largest, most complex procurement undertaken by the Government of Canada, with a total estimated project budget of $56 billion to $60 billion. -- The ships will replace the Halifax-class frigates and the retired Iroquois-class destroyers. With them, the Royal Canadian Navy will have modern and capable ships to monitor and defend Canada’s waters, to continue to contribute to international naval operations for decades to come and to rapidly deploy credible naval forces worldwide, on short notice. -- This entire procurement process has been overseen by an independent fairness monitor. Reports are available online. -- The bid met all of Canada’s mandatory compliance requirements and has satisfied the due diligence process. -- Construction on the Canadian Surface Combatants is scheduled to begin in the early 2020s. 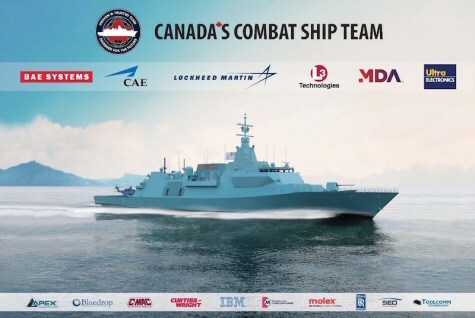 -- Lockheed Martin Canada’s winning bid includes BAE Systems, CAE, L3 Technologies, MDA and Ultra Electronics Maritime Systems. BAE Systems’ Type 26 Global Combat Ship has been chosen as the design for the Canadian Surface Combatant (CSC), with the contract awarded today to Lockheed Martin Canada by Irving Shipbuilding. Irving Shipbuilding is the Canadian Surface Combatant Prime Contractor to the Canadian Government for the build of all 15 ships at its Halifax Shipyard. BAE Systems, CAE, L3 Technologies, MDA and Ultra Electronics have partnered with Lockheed Martin Canada in a successful offering to the Royal Canadian Navy of one of the most advanced and modern anti-submarine warships in the world. The design is based upon the Type 26 Global Combat Ship with GLASGOW, first in class, currently in build for the Royal Navy at BAE Systems’ shipyard in Glasgow, and will be equipped with high-tech platform innovations from prominent Canadian companies. BAE Systems has been awarded a contract from Lockheed Martin Canada for the design of the Type 26 variant for the Canadian Surface Combatant. Andrew Wolstenholme, Group Managing Director, BAE Systems Maritime and Land UK, said: “The selection of the Type 26 design for the Canadian Surface Combatant reinforces its position as one of the world’s most advanced anti-submarine warships and showcases the strength of British innovation on the global stage. The programme will benefit from advanced digital design techniques and builds on the Royal Navy’s formidable pedigree in anti-submarine warfare and extensive operational experience. The Type 26 Global Combat Ship is a globally deployable multi-role warship that meets the distinctive mission requirements of the Royal Canadian Navy. Purposely designed to support anti-submarine warfare, air defence and general purpose operations anywhere on the world’s oceans, the ship will be acoustically quiet, versatile and highly survivable. OTTAWA, Ontario --- Canadian technology, experience and infrastructure proved a winning combination for Canada's new fleet of surface combatants, as Canada's Combat Ship Team has been awarded the Canadian Surface Combatant design contract by Irving Shipbuilding. Irving Shipbuilding is the Canadian Surface Combatant prime contractor and will build all 15 ships at Halifax Shipyard. BAE Systems, CAE, Lockheed Martin Canada, L3 Technologies, MDA and Ultra Electronics partnered as Canada's Combat Ship Team to offer the Royal Canadian Navy the most advanced and modern warship design, the Type 26 Global Combat Ship, with high-tech platform innovations from prominent Canadian companies. The solution includes the internationally renowned and Canadian-developed combat management system, CMS 330. Bringing together a pan-Canadian team, the six companies have a uniquely skilled workforce and supply chain that are ready to begin work on the program today. Canada's Combat Ship team employs a combined 9,000 Canadians in 40 facilities from coast to coast and engages a Canadian supply chain of more than 4,000 small and medium sized enterprises. The team also secured several additional partners, including Rolls-Royce with its Canadian-designed and manufactured Mission Bay Handling System that will enable adaptability for the ships' operations. The Type 26 Global Combat Ship is a globally deployable multi-role warship that meets the distinctive mission requirements of the Royal Canadian Navy. It is enhanced with the team's collective Canadian naval expertise in combat system design, integration, training, logistics and program management. Purposely designed for high-end anti-submarine warfare and capable of performing a variety of missions around the world, the Type 26 is acoustically quiet, versatile, highly survivable, and allows for significant growth margins for future modernization. Canada's Combat Ship Team will deliver lasting economic benefits to Canadian industry through $17 billion in value proposition commitments in innovation across Canada's priority areas, including $2 billion in supplier development, $2 billion in research and development, and $200 million in advanced manufacturing. All of this contributes to a strong Canadian team - Canada's Home Team - ready to begin work on day one as promised. "We are delighted to be part of Canada's Combat Ship Team that has been awarded the Canadian Surface Combatant design contract. We believe that the Type 26 Global Combat Ship is the right solution for Canada, combining Canada's trusted Combat Management System with the world's most advanced warship design and bringing together a pan-Canadian team with a proven track record and current capability to perform complex defence projects," said Anne Healey, General Manager - Canada, BAE Systems. "As one of Canada's largest defence companies, we are proud to be part of this pan-Canadian team selected for the Canadian Surface Combatant program. We look forward to working closely with the Government of Canada, Irving Shipbuilding and the entire team to develop and deliver world-class capability that prepares the men and women of the Royal Canadian Navy for mission success," said Joe Armstrong, Vice President and General Manager - Canada, CAE. "This award is true validation of our Canadian capability. Our team is honoured, knowing that we offered the right solution for Canada and a proven ability to perform on complex defence programs. Lockheed Martin Canada is ready to continue serving as Canada's trusted Combat System Integrator, as it has for more than three decades, leveraging the innovation and talent here at home that will ultimately result in unprecedented economic outcome for Canada," said Gary Fudge, Vice President and General Manager, Lockheed Martin Canada Rotary and Mission Systems. "With over 2,200 Canadians working at L3 Technologies, we stand ready to deliver the latest EO/IR sensors, Integrated Platform Management, Integrated Communications and Torpedo Handling systems for the Canadian Surface Combatant. With proven capability on existing Canadian ships, L3 Technologies is proud to be on the team that will deliver the world leading performance expected by the Royal Canadian Navy," said Rich Foster, Vice President, L3 Technologies Canada. "As one of Canada's leading space and defence companies, MDA's participation in this project validates our expertise in electronics, antennas, signal processing, system engineering and mission software capabilities. In addition to providing world-class operational CSC capability to the Canadian Armed Forces, this project will be a catalyst for exporting more of our technology to the global naval market," said Mike Greenley, Group President, MDA. "As the underwater warfare lead on the CSC Home Team we are bringing to bear our considerable depth of anti-submarine warfare experience and capability, ensuring Canada's new ships will provide an enduring operational advantage to the Royal Canadian Navy. This work will generate high-tech jobs in Nova Scotia for sonar design and manufacturing and add to our existing significant export capability," said Bernard Mills, President, Ultra Electronics Maritime Systems. "Our experience and world-leading capability as providers of integrated power and propulsion solutions will deliver these warships with exceptional power through-life and the superb acoustic performance essential to anti-submarine warfare operations. Our Canadian-designed and manufactured Mission Bay Handling System will allow the essential flexibility and adaptability for future operations," said Bruce Lennie, Vice President Business Development & Government Affairs, Rolls-Royce Canada. -- BAE Systems is a world leading shipbuilding, support and maintenance company with the skills and expertise to design, build, integrate, test, commission and support complex warships. BAE Systems has operated in Canada for over 100 years partnering over a recent period with over 240 Canadian companies. BAE is active across Canada with equipment including Hawk trainer jets, Submarines, cyber security, Hybrid drive busses, and naval guns. -- As a globally-recognized training systems integrator, CAE is committed to providing defence and security forces world-class training centres, training services, and a comprehensive portfolio of training solutions. CAE is headquartered in Canada and has employees in 15 locations across the country. -- Lockheed Martin Canada has been Canada's trusted defence partner for nearly 80 years and has a proud legacy of providing innovative naval systems and sustainment solutions for Canada and abroad. For more than three decades, Lockheed Martin Canada has demonstrated its capability and commitment to the Royal Canadian Navy as the Prime Contractor and Combat System Integrator for the HALIFAX Class Frigates. The company employs approximately 1,000 employees at major facilities in Ottawa, Montreal, Halifax, Calgary, and Victoria, working on a wide range of major programs spanning the aerospace, defence and commercial sectors. -- A leading provider of communication, electronic and sensor systems used on military, homeland security and commercial platforms, L3 Technologies is also a prime contractor in aerospace systems, security and detection systems, and pilot training. With over 50 years of business operations in Canada, L3 has a strong Canadian presence with L3 MAPPS, L3 MAS, L3 Communication Systems Canada and L3 WESCAM that each have experience working on technologies and projects for the Royal Canadian Navy. -- MDA is an internationally recognized leader in space robotics, space sensors, satellite payloads, antennas and subsystems, surveillance and intelligence systems, defence and maritime systems, and geospatial radar imagery. Founded in 1969, MDA is recognized as one of Canada's most successful technology ventures with locations in Richmond, Ottawa, Brampton, Montreal, Halifax and the United Kingdom. MDA has supported the Royal Canadian Navy for over two decades. -- Based in Dartmouth, Nova Scotia, Ultra Electronics is a part of the Ultra Electronics Group, an international defense and aerospace company. Ultra Electronics has been delivering world-leading underwater warfare solutions to the defense market for 70 years. Today, Ultra Electronics is recognized worldwide for its expertise in hull mounted sonar, towed active and passive arrays, sonar sensors, and underwater acoustics. -- Rolls-Royce has been established in Canada for over 70 years and today employs over 1500 Canadians at eight locations across six provinces. Rolls-Royce plays an active role in many of the world's major defence programs offering advanced system solutions to navies and coastguards. With the design and design team for Canada’s future surface combatant determined and the contracts for this work awarded, design work will now start. The design work is projected to take three to four years to finalize, which means construction will start in the early 2020s, as projected. The overall objective of the design process is to ensure that the delivered warships meet the Royal Canadian Navy’s needs and to integrate the proposed Canadian content. A joint design team, with representatives from Irving Shipbuilding and Lockheed Martin Canada, will use a structured design process to modify the existing design and develop the final production-ready design prior to starting construction. This work includes modifying the selected base design to meet Canada’s requirements, and to incorporate Canadian systems and equipment. This design team will also manage the design work, perform the required systems engineering and develop the integrated data environment necessary to efficiently manage a project of this size and complexity. The design phases include requirements reconciliation, the preliminary design, the functional design and, finally, the creation of the detailed design for the Canadian Surface Combatant ships. At the end of the design process, there will be a complete 3D model of the ship and Irving Shipbuilding will deliver an implementation proposal that will detail the plans and costs for building the ships. Throughout the design process, the team will focus on getting the design right to ensure the ships will meet the needs of the Royal Canadian Navy today and into the future. As per Canada’s policies, Irving Shipbuilding will be required to provide 100% of the contract value in industrial and technological benefits in Canada and will be required to invest 0.5% of the contract value in improvements to the health and viability of the greater Canadian marine industry, as per their commitment under the National Shipbuilding Strategy. The construction of the first Canadian Surface Combatant will begin only once the design has reached the required level of maturity. It is currently expected that the construction of Canada’s future warships will begin in the early 2020s.